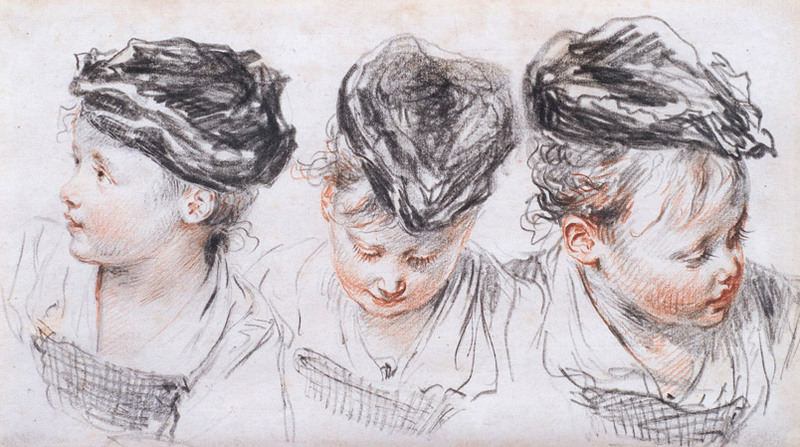 He drew obsessively from life, and had such an aptitude for this that one contemporary observed that Watteau “was more satisfied with his drawings than his paintings”. According to the Comte de Caylus, Watteau’s friend and biographer, the artist kept all of his immaculate studies in a bound volume, which he plundered when it came to creating a painting. A central preoccupation of scholars of Watteau’s drawings is to spot the frequency with which particular figures appear almost verbatim in the paintings. To complicate things, Watteau often sketched on sheets of paper already decorated with drawings after intervals of several years.